As of the time of publishing, the 1952 Henry J Corsair shown in the photos is listed for sale at this link on eBay. The Henry J wasn’t in production very long – actually just four short years – though the unsold ’53s were sold off as ’54s to clear the inventory which gave the impression of five years of production (1950-54). The Kaiser-Frazer Corporation got a federal loan to build the Henry J in 1949 and the cars went into production in Willow Creek, Michigan in 1950. Henry J’s were the brainchild of the company’s chairman, Henry J Kaiser, and they were also named after him. Henry J cars seated five, had to be able to go at least 50-mph to get the federal loan to build them, and were tested on back roads in Arkansas to see how much abuse they could stand up to before being released to the buying public. There were three versions of the Henry J sold in the US in 1952, though there were some slight differences and one was sold under a different name. The one in the pictures is an example of a 1952 Henry J Corsair, and it came with (and has) a four-cylinder engine. The next was the Henry J Corsair Deluxe, which came with a six-cylinder engine and some changes like a wider grille and changes to the tail lights. 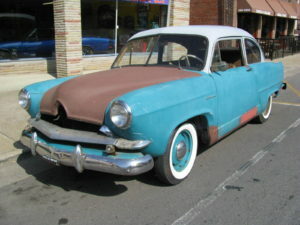 The third and lesser-known ’52 Henry J was marketed under a different name and sold by Sears, Roebuck, and Company – the 1952 Allstate. 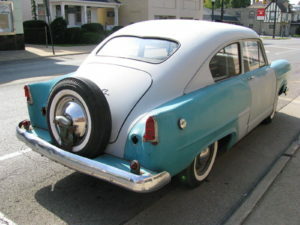 It’s hard to tell a ’52 Allstate from a ’52 Henry J Corsair by looking at the body lines, but there are a few differences elsewhere on the vehicles: the Allstate had a different grille, hood ornament, hubcaps, identification badges and interior trim. The Henry J was never as popular as the company had hoped, and met with disappointing sales with each update and change, but it’s story is an interesting piece of automotive history, and it’s an incredibly rare, edgy, and eye-catching vehicle that’s getting harder and harder find in today’s collector car market. Part of the reason Classic Cars Online US exists is to help connect classic car buyers and sellers, and we’ve added several ways for you to connect – pick your favorite, or join us in all four places: (1) sign up on the Classifieds page here on the site, (2) visit and like this site’s Facebook page, (3) the Best Classic Cars for Sale page or (4) join the Classic Cars Online: Classic Cars for Sale group if you are looking to buy or sell vintage Henry J cars.